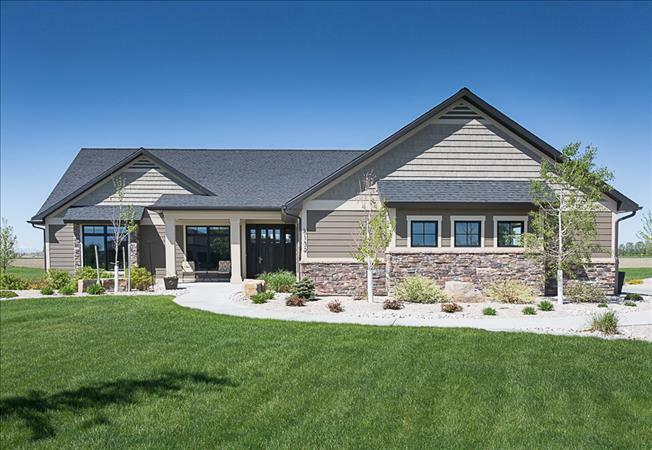 Pure tranquility describes this beautiful rancher on 1.5 acres just far enough out but still having city conveniences close. This builders personal home is 4 bedrooms (3 on the main), 3 baths, a beautiful dining room with views, the living room has a custom fireplace with venetian plaster, TV and glass shelving and lots of natural light. You can cook to your hearts content on the 6 burner gas cooktop with a pot filler at your finger tips, convection oven, and convection microwave all while being entertained by the surround sound Sonos System playing your favorite music from your phone! The large master bedroom has patio access, 2 walk in closets, and a locker room sized shower with a steam unit and body sprays, the vanities have venetian plaster to add that extra touch. The sprawling basement has surround sound, radiant in-floor heat, a large beautiful custom built in wet bar with TV, space for a pool table and your favorite games. A "safe" room enclosed in concrete for your gun collection or maybe wine storage! The basement bedroom is oversized with a huge walk in closet, there is room for an additional identical bedroom to be finished in the future or use it as a nice sized unfinished storage room. The house has 3 hot water heaters; 1 for the in-floor radiant heat that services the garage and basement, and 2 for domestic use, as well as a water softener and humidifier. The shop has an 1100 sqft apartment above it for Mom to live in or maybe your college aged kids. It has 1 large bedroom, walk in closet, W/D, 1 bath, kitchen, and large walk in pantry. The lower level has a beautiful office with a half bath and built in desks, perfect for the self employed! The whole main level of the shop/office has radiant in-floor heat. The shop could be the ultimate "man cave" and even has a "hunting storage" room. For those with a "green thumb" there are 5 large gardening bins that are sprinkled and ready to grow whatever you plant in them! The amazing back patio has a huge gas fire pit that creates the ultimate ambiance for relaxation after a long day, not to mention the space that is ready for your hot tub! There is nothing like sitting on the patio watching the sunset behind the wood burning fire pit that is in the west end of the property. The subdivision consists of 24 lots and is about 3/4 built out. There is a 2.5 acre park in the center of the subdivision for your use. The HOA fees are $100 per month and covers snow removal on the streets only, lawn care for the entries and park, and general liability insurance for the common areas. This home is 100% move in ready and I don't think we missed any details when building this paradise!